Salaams my lovelies! I hope you are all doing well inshallah. It is almost time for my most favorite time of year: Ramadan! For those of my readers who may not know what Ramadan is, it is one of the holy months in the Islamic calendar where Muslims fast from eating food, drinking even water, and sexual relations during daylight hours. Nights are spent in hours of prayer and spiritual contemplation. Muslims believe this is the month that Shaytan (the Devil) and his minions are chained as well. It may seem bizarre to some that a month where worldly pleasures are denied can be my favorite time of year. However, if you ask a lot of Muslims, they will agree. There is a sense of closeness with Allah swt (God) in this month because there is an ongoing dialogue all month be it through fasting, prayer or charity. Trust me when I say it took a long time to appreciate this month. As a youngster to be told to shut off Buffy the Vampire Slayer to pray was just agony. Now that I have my own little girl, I have been trying to think of ways to welcome this holy month in my own household and let her know how very important this month is to me and to a lot of Muslims. I think growing up we noticed how other faiths like Christianity and Judaism were able to make their own holidays special. For Ramadan, I think it is important to associate good feelings with your own children. For me, I plan to decorate my home to welcome Ramadan and ask my daughter to help me. I do this for Eid too. On Eid, my toddler woke up to a gorgeously decorated home and was so excited because she knew it was a special day. I already started telling her about how Ramadan is coming and how we will pray to Allah for anything we need (even if it means Hello Kitty stickers). If you don’t want to make your own Ramadan decorations, make sure to check out Modern Eid. They have an amazing selection of Ramadan and Eid decorations that are just the right amount of stylish and are fit for Pinterest. 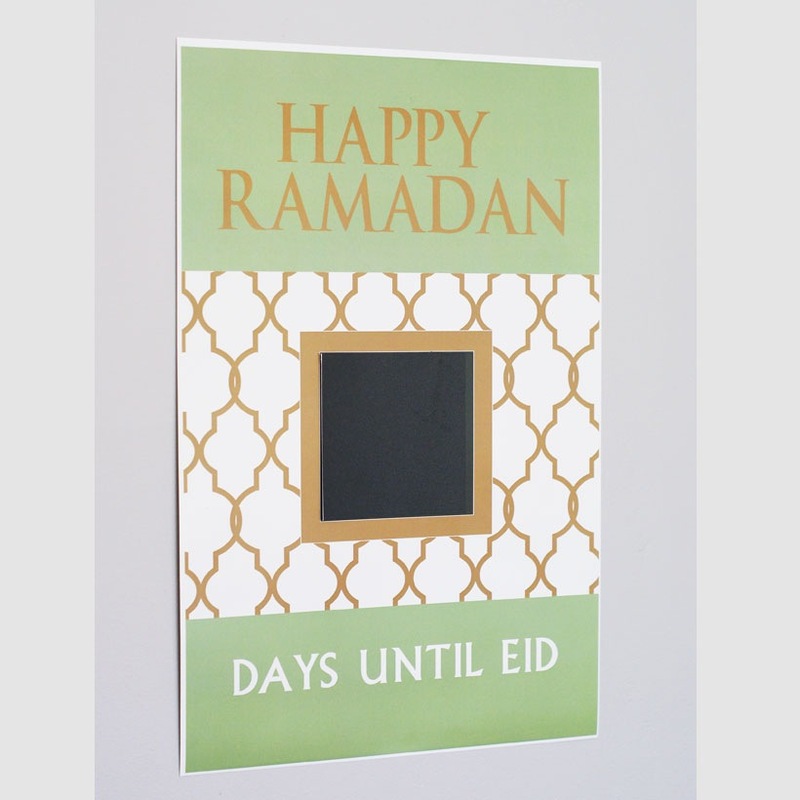 I will be ordering their Ramadan Countdown poster so that Safiya can countdown the days to Eid with good deeds that she can do daily. I also plan to map out what I will be cooking (only easy dishes) so that I can make time to pray and read our holy book The Quran. If your child sees you pray, she will start to do it herself. Parents really do lead by example. I also helped my own daughter map out good deeds she can do all month. These good deeds are as simple as helping by picking up toys, giving someone a smile or hug and even donating old toys to a charity. Another way to get your kids excited about Ramadan is to get together during Ramadan with other couples and their kids who practice too. If your child sees that other children are fasting and are excited about Ramadan, it becomes contagious. The moms and kids can do something simple, like read a Ramadan story and have iftar or even do a simple dua with the kids. It is also nice since the mommies can get a break from cooking that day too! I am also thinking of ways to make some memories with my little one too. I want her to remember that Ramadan is a special time where we did special things together. One of those ways is to work with her and bake some cookies. When we bake our “Ramadan” cookies, she will remember good times with her mama and also remember a special Ramadan recipe. If you want, I can share my special “Ramadan” cookie recipe with you too! What are your plans to make Ramadan special for your family? Let me know in the comments below! The Hijablog rocking a Madamme BK modest swimsuit. Salaams my lovelies! I hope you are all doing well inshallah. I know that since summer has arrived, I have seen my spare time shift to spending more times outdoors, in the sun, and even by the pool. Yes, I wrote the pool. Contrary to what some hijabis think, you can spend time at the pool or beach and still be modest. Long ago, I remember that I had to resort to wearing long sleeved shirts and quick drying workout pants in order to “swim.” One of the saddest things I can confess is that since I wore hijab at such an early age, I never really learned how to swim! I could never find a modest outfit that allowed me to swim or learn to swim properly. Inshallah, I plan to learn to swim soon since swimming is one of the activities the Prophet (saws) recommended all believers should know (along with riding a horse and archery). When the burquini came on to the scene, I viewed it as an opportunity to learn the skill I so badly wanted to learn. Madamme BK: Seen on the likes of Yaz the Spaz, the Hijablog, Indahnadapuspita, and other hijabi fashion icons, this modest bathing suit is perfect for the fashionista type who doesn’t want to compromise her sense of style or modesty while she is out at the pool or beach. Simply Zeena: This line of swimwear are for the practical hijabis who need a suit that is functional and not too frilly. This line is perfect for young hijabi moms who don’t want their kids tugging on their suit. Modest Sea: A line of swimwear for the athletically inclined. The aerodynamic suits with racing stripes and sporty details are ideal for a hijabi who loves to work out and play hard. Burqini: I couldn’t ignore the original modest bathing suit for hijabis could I? An old standby and the brand trusted by Australian lifeguards. Do you have a modest bathing suit that you love? Share the love and let us know in the comments below!